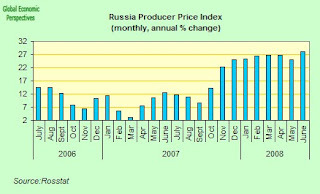 Russian producer prices, generaly considered an early indicator of inflationary pressures in the economy, rose in June at the fastest pace in three and a half years on record energy and metal costs. The cost of goods leaving Russia's factories and mines was up by 28.1 percent, compared with 25.1 percent in May, according to the Federal Statistics Service. Prices rose 4.9 percent month on month from May. 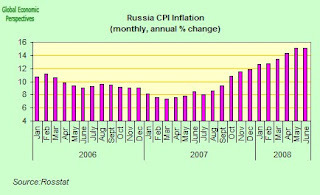 Factory-gate inflation together with consumer-price growth which reached 15.1 percent in June - the quickest pace since December 2002 - now represents the most significant immediate threat to Russian economic growth. 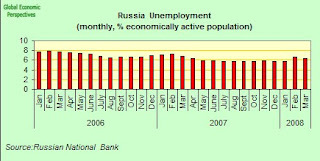 Russian unemployment rate also fell again in June to touch 6.2 percent, while real (ie allowing for inflation) monthly wages increased an annual 11.7 percent to 17,808 rubles ($767) and industrial investment rose just 10.8 percent, the slowest pace in over two years. Industrial production grew by a meagre 0.9 percent in June. 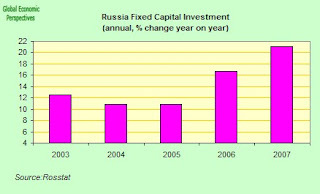 The Russian government has forecast the economy will expand 7.6 percent growth this year, compared with 8.1 percent in 2007. Gross domestic product probably rose 8 percent in the first half, Interfax news service reported today, citing an unidentified government official. 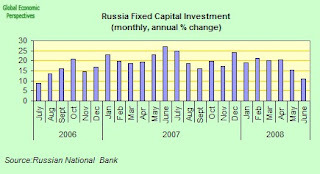 Russian industrial production rose in June at an incredibly low year on year rate of 0.9%, down from 6.7% in May, and the slowest pace in five and a half years as production of locomotives, cement and oil fell. 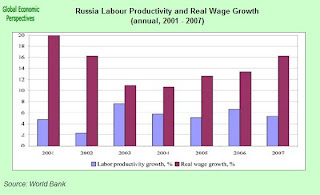 The result was the slowest rate of growth since the Russian Statistical Service (Rostat) began calculating industrial production under a new methodology in 2003. Production dropped 1.4 percent from May. Production of locomotives fell by 20 percent, while output of buses dropped by 16.6 percent, the service said. Cement production was down 13.5 percent and steel pipe output eased 4.3 percent. 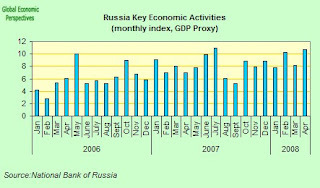 State orders for goods have lost momentum since government changes carried out in early May, when Vladimir Putin, appointed prime minister on May 8 after leaving the presidency, moved officials from the Kremlin into new administration roles. 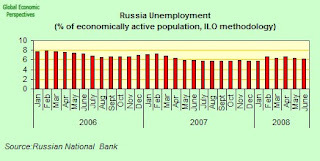 Russia's economy grew 8.5 percent in the first quarter. Annual investment growth averaged more than 20 percent in the first three months, spurring expansion in the construction and retail industries. ussian Railways, which operates the world's longest train network, said in February that it is seeking to raise 325 billion rubles ($14 billion) in the next three years to help expand and upgrade its train network. Manufacturing increased an annual 0.6 percent in June, compared with 10 percent the previous month, the service said. Mining and quarrying rose 0.6 percent, compared with growth of 0.1 percent in the previous month. Crude oil and gas condensate production fell 0.8 percent compared with a year ago. Electricity, gas and water output increased an annual 4 percent in June, compared with 2 percent in the previous month. Russia's central bank raised its key interest rates by a quarter-percentage point today, and this was the fourth time this year they have raised. The refinancing rate will be lifted to a 1 1/2 year high of 11 percent as of July 14. 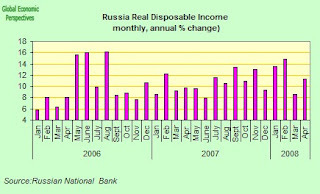 The minimum rate for taking out one-day loans from the central bank in repurchase auctions was increased to 7 percent. 11% may seem like a high rate, but with inflation at 15% this still constitutes a negative real interest rate of 4%. 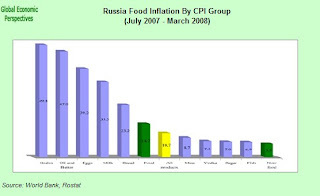 Bank Rossii raised borrowing costs in February, April and June to control price growth after the inflation rose to a 5 1/2 year high of 15.1 percent in June. 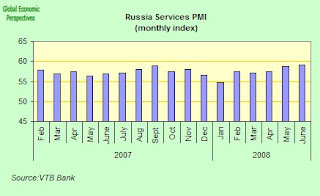 Russian service industries - ranging from banking and telecommunications to restaurants - expanded more rapidly in June according to the VTB Bank Purchasing Managers' Index for services, which rose to 59.1, the highest reading in nine months, and up from 58.7 in May. 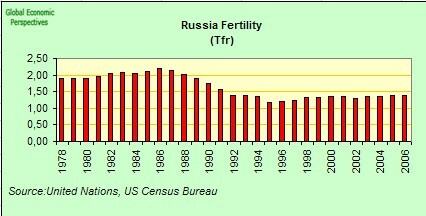 A reading above 50 shows expansion. Input prices eased from the month before to the second-highest level since the index was created in October 2001, the bank said. 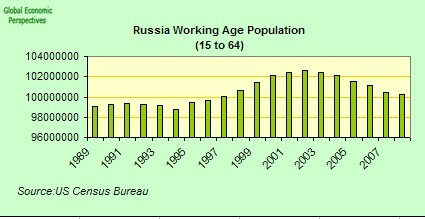 Economic growth in Russia is being fuelled by record crude prices, which are boosting wages and consumer spending. 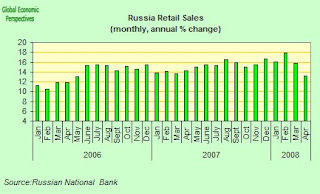 Retail sales rose an annual 14.6 percent in May and the inflation rate reached 15.1 percent, government figures showed. The central bank set an inflation target of 8.5 percent for this year after the rate jumped to 11.9 percent last year, and raised it to a range of between 9 percent and 10.5 percent in March. 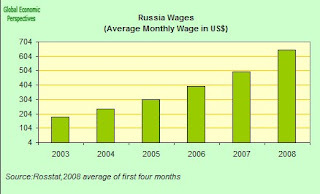 The OECD have estimated that the inflation rate may reach 13 percent whole year 2008. Russian oil production declined in June, bringing the world's second-largest crude exporter closer to its first annual drop in output since 1998. 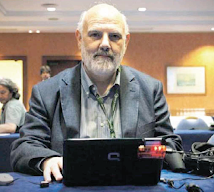 Production fell to 9.77 million barrels a day (40 million metric tons a month), 1 percent less than in June last year, according to data released by CDU TEK, the dispatch center for the Energy Ministry. 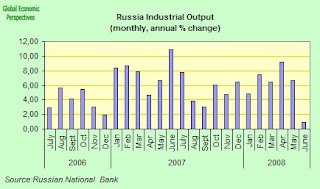 Compared with May, output was up 0.2 percent. There is increasing speculation that Russia's output may have peaked as producers struggle with ageing fields, rising costs and increasingly remote new deposits.